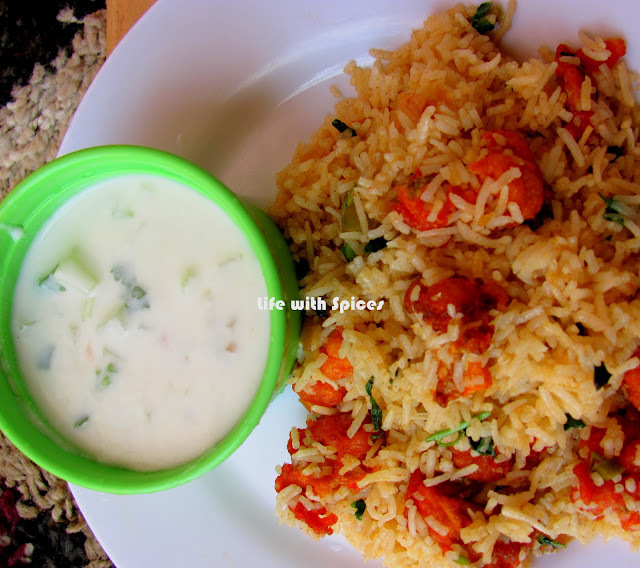 A quick and flavorful rice dish with less work on a lazy Sunday afternoon which pairs so well with simple raitha. In a bowl mix corn flour, rice flour, maida, food color, salt and red chilli powder and add just enough water and make into thick batter. Heat oil in a pan dip each florets in the batter and deep fry them. In a pan heat oil add onion and fry until they turn golden brown add ginger and garlic paste , green chillies saute well then add chilli powder, pepper powder, garam masala and salt mix them well. Add cooked rice mix them well without breaking the rice. Now add Gobi 65 and chopped coriander mix them well and serve hot with raitha. wow! !loved this new and innovative rice preparation..must be delicious! Gobi 65 rice looks delicious Kalpana. This is hard work! Making the gobi 65 and the rice. And you call it a lazy sunday meal. Wow! You must be a super cook. Can't wait to try this,delicious rice. 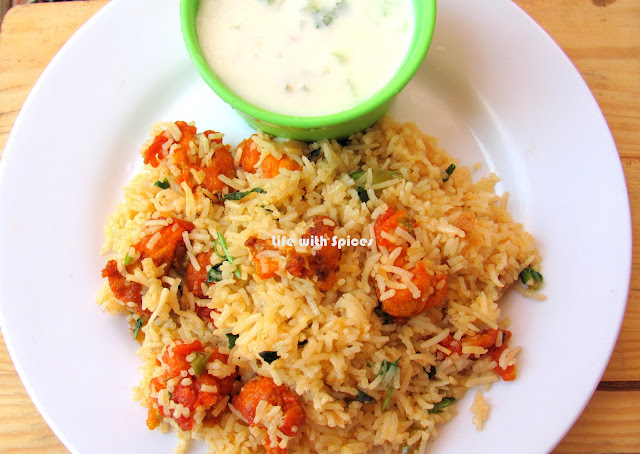 Yummy flavorful rice...Loved the idea..
Never thought of making rice with gobi 65,sounds truly awesome. Wow, wow, looks simply awesome..
gobi 65 on its own itself is yum so if its in a flavoured rice i can only imagine how amazing that must have been. Thx kalpana,tried n post it ! !